No matter the medical profession, storing equipment and instruments in medical cabinets is vital to maintain a sterile and organized environment. 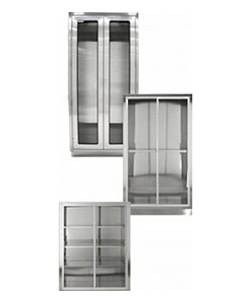 Auxo Medical offers a variety of features and options for medical cabinet units. Base units, overhead units, and wall units allow for storage of medical equipment, regardless of the size, customized to your needs. Besides offering high capacity storage, many of our units also offer various features for work surface needs. Easy to clean and durable, these medical cabinets are quick and easy to install in your facility. Offering features that vary for your needs, including glass or stainless steel hinged doors, sliding glass doors, pegboard backs, various locks, and lighting, Auxo Medical has your medical equipment storage needs covered. Built for years of service, our medical cabinets will maintain order within your facility and provide the best use of space.